For the last several months, I’ve been trying to rework my workflows in regards to equipment choices. As a result of a long story I won’t recount here, I lost my 2013 MacBook Air – so I needed to find a replacement. My home setup is a trash can MacPro with two 27” monitors, which has been and continues to be a great setup for my work. My mobile needs were not extensive, so I started thinking, gee, maybe I can try going iPad only. So the search began. I owned a 9.7” iPad Pro, so I started there. I tried out a few keyboard folio cases, and external keyboards to see what would work well. I settled on a little keyboard from Logitech called Keys-to-Go, that works well for me. I’m not very picky on the keyboard I use, I can pretty much acclimate to any keyboard. So, part of the process of course includes software. My day to day work isn’t anything too demanding like audio/video recording or heavy graphics work. It’s mostly around SQL queries and data work and with a collection of apps I got pretty close to being able to work remotely completely on an iPad, but just enough little things kept creeping up to make that not a long term solution. So after buying several different keyboard portfolios, trying different apps, buying and returning the 12.9” iPad Pro, I came to the conclusion that I still needed a full laptop to be functional on the road. Enter the MacBook, purchased early October within the middle upgrade option for the processor, paired with my original 9.7” iPad Pro and the Logitech keyboard, and I had a great setup that was easy to travel with and handled the work I needed. Then came the October 30 Apple Event, and I again began to question everything. Would the new iPads turn the tables on my attempt to go iPad only? Would the new MacBook Air be a better solution? And wow did I ever want that new MacMini even though I had no need or use for one – I’m sure I could come up with something if I tried hard enough. I had a week long trip coming up and I had just recently gotten all the apps set up on the new MacBook and companion apps installed to my 9.7” iPad, a week on the road away from my home setup, a great way to test it all out. 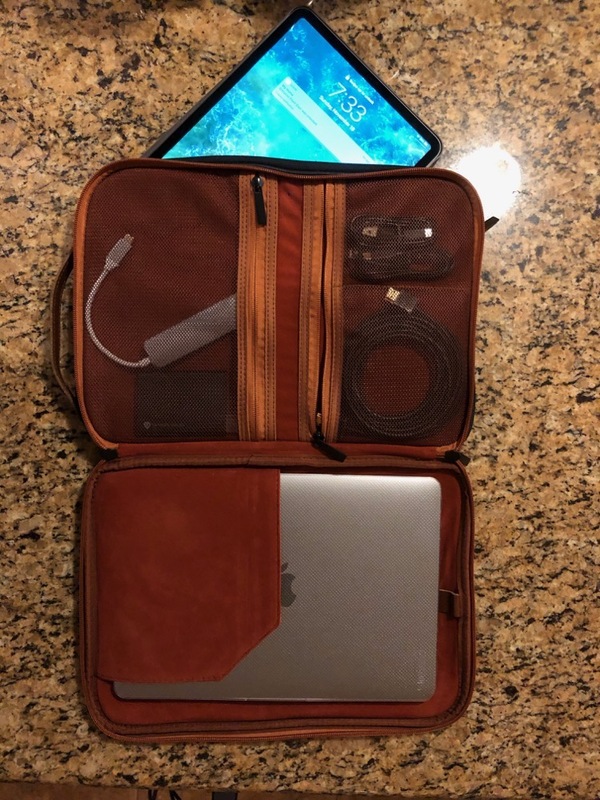 Well, it went flawlessly and I was very happy with the setup, accomplished everything I needed to with a very light weight travel setup that included a USB-C battery bank that could recharge the MacBook completely and had a little extra for my iPhone X and 9.7” iPad Pro, a Samsung T5 1TB external SSD for the larger files I needed and to hold my Windows VM that runs perfectly fine off the external SSD from the MacBook. Well, it’s now late mid-November, and here I sit, typing and recording this little review completely on my brand new 11” iPadPro. Still keeping the MacBook, but upgraded the iPad, and it’s a great device. FaceID works flawlessly on it, much better than on my iPhone X, the screen is a great size, not too large, but noticeably and comfortably larger than the 9.7”, my little Logitech keyboard works great, and I can record audio using my Blue Snowball mic attached via the same USB-C adapter I have for the MacBook that includes an HDMI output and USB-A ports. I can also send the new iPad display to an HDMI TV with the same adapter, so many new avenues of workflow opened there. In the near future, I will be looking at Luna Display to be able to use the 11” iPad Pro as an additional display on my MacBook, but I’ve been happy using it as a separate device in conjunction to my MacBook so far. I must also admit, that I am within the 2-week return period, and before leaving for Thanksgiving, there’s a chance I’ll trade up to the new 12.9” as, with the smaller bezel it might be a more acceptable size for my needs than the previous models – any excuse to visit the Apple Store I guess.